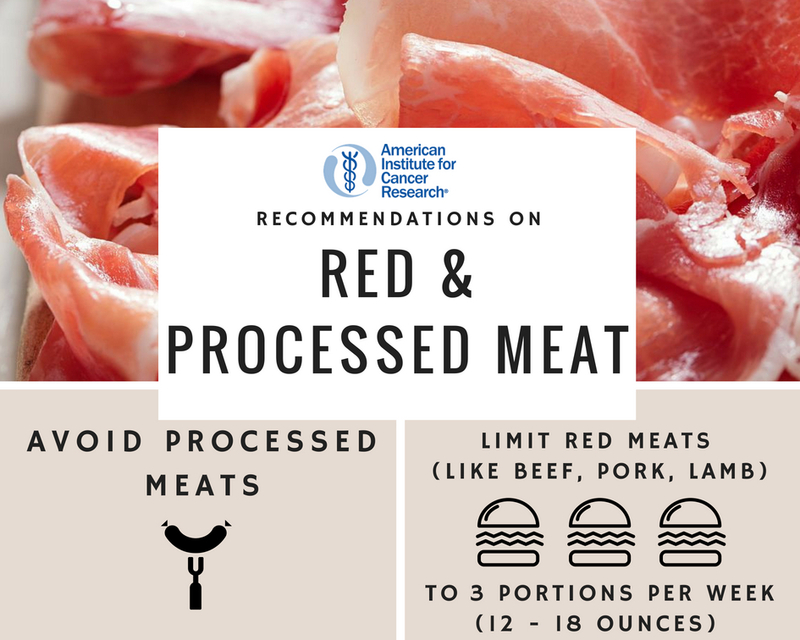 The latest research shows that eating more than 18 ounces of red meat per week increases the risk of colorectal cancers. Beef, lamb and pork are all red meats. Researchers do not yet know exactly how red meat affects the development of colorectal cancer. Red meat contains compounds that have been shown to damage the lining of the gut and possibly promote cancer. Cooking red meat at high temperatures can also produce other cancer-causing compounds. Processed meats are meats that have been preserved by smoking, salting, curing or adding other preservatives. Sliced turkey and bologna deli meats, bacon, ham, and hot dogs are all processed meats. Research shows that any amount of processed meat eaten regularly increases the risk of both stomach and colorectal cancers. There are many possible ways that processed meat may increase cancer risk. For example, compounds used as preservatives may lead to cancer-causing compounds in the body. AICR recommends avoiding bacon and other processed meats, saving them for special occasions. For hamburgers and other red meats, you don’t have to eliminate them from your diet, but work to eat smaller portions and/or have meat-free days.